I never realized how dependent I am on my oven but it has been broken since before I got back from my trip (a week and a half now) and the fix-it guys never showed up yesterday and rescheduled for next Wednesday. That is almost three weeks without an oven and I think I may go crazy. Last night we had guests for dinner and had to microwave everything and it just doesn’t work out quite as well. Even the easy foods that I think to have since I don’t have an oven (i.e. frozen pizza) are impossible. If anyone has any ideas for good stove top only meals, let me know. My powers of creative thinking are lacking today. Though I’m sure I’ll come up with something. My grandma used to make pumpkin cookies for us every year around Halloween/Thanksgiving time. And now it just doesn’t seem right to not have them. So, I tried making them myself. It was quite the process and somehow managed to take me two days. Maybe D is right and I just can’t cook fast :-). I started Sunday and the dough just wasn’t chilling fast enough so I finished them yesterday. I even made some green icing for the stems in true pumpkin cookie fashion. Then I find out after all of my trouble that I used the wrong cookie recipe. I still think that they turned out well if I do say so myself. 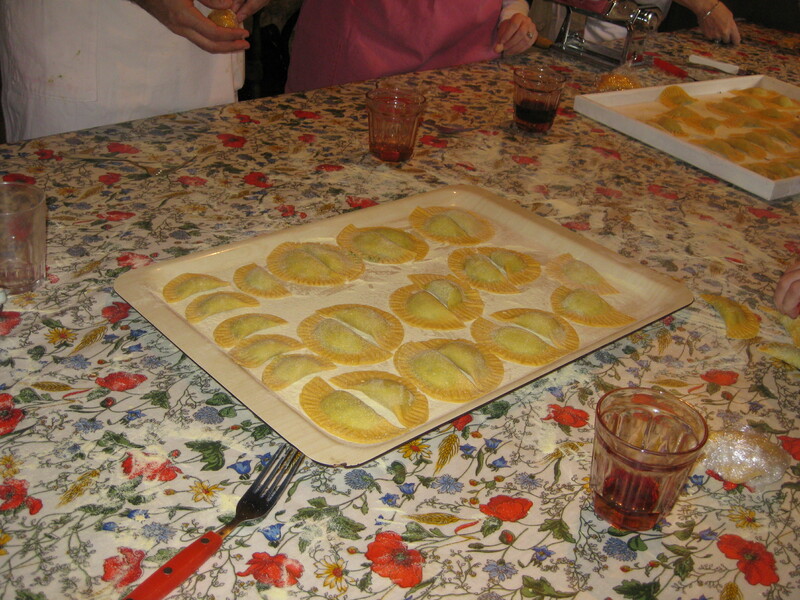 Last Thursday, while in Italy, I took a cooking class. The tour company is called The Accidental Tourist (www.accidentaltourist.com) and it was fantastic. Our guide, Jesse, was very good. I would wager to say that the day was one of the most fun we had while in Italy and I would highly recommend it to anyone looking for something to do while visiting Tuscany. We did the full day. In the morning, they picked us up in Florence and drove us out into the Tuscan hillside to the first villa and vineyard. This villa was amazing. It is currently owned by a family in the fashion business in Milan that uses it solely as a vacation home a couple times a year and bought it because making wine was a hobby. 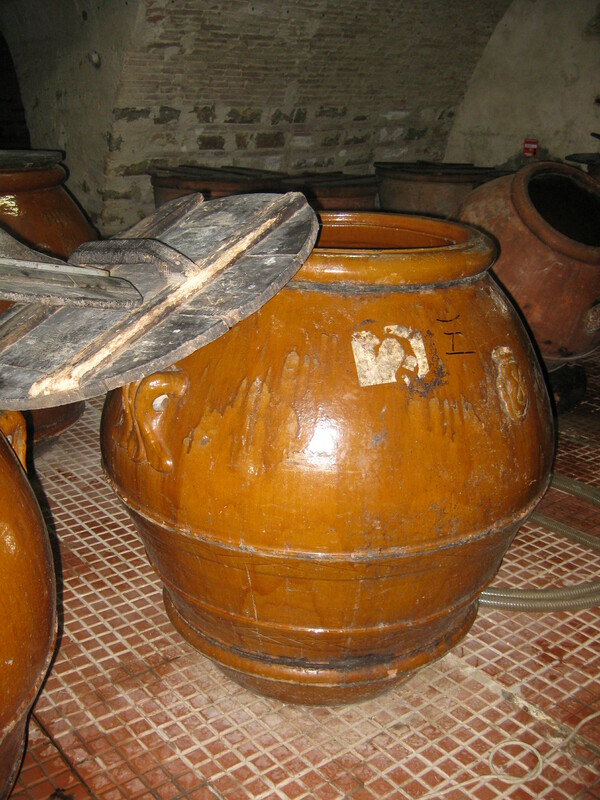 We got the tour of San Grignano and learned how they make olive oil and wine. It was very interesting and I can see why people would like wine as a hobby. I also would say I have a much greater appreciation for wine and olive oil. 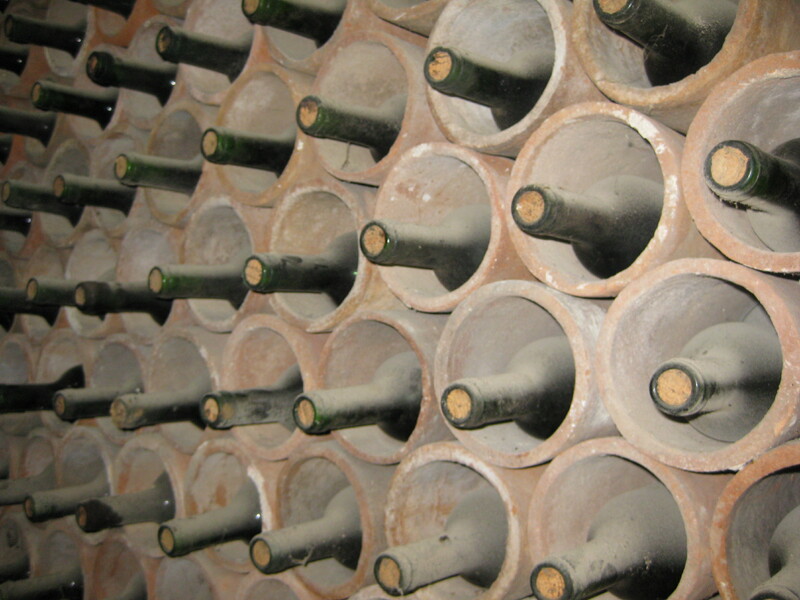 It takes nearly a year and a half to produce wine from the time the grapes have been picked to the point it is ready for people to drink. 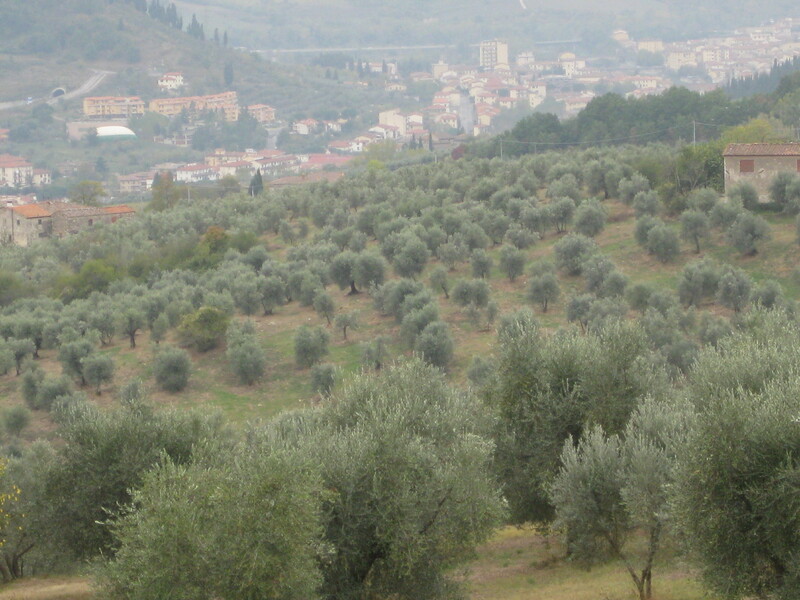 And it takes so many olives to produce olive oil. One olive tree on average produces 2 liters of olive oil. Now I know why it is so expensive. Make sure from now on when you are buying you get olive oil that was produced and bottled in Italy. After the wine, we went to villa number 3. This used to be a watch tower built in the 1100s for the castle down the road. The family that owns it had added on more living space about 300 years ago. It was everything you woule ever imagine a Tuscan villa to be (aside from the very modern, stainless appliances and plasma television). People live in this house and we used their basement for our cooking class and learned how to make fresh pasta. We made taglietelle and spinach & ricotta ravioli. While we were making pasta downstairs, Cristiana was upstairs cooking the rest of our meal. We joined her later to have an amazing dinner. It started with a cauliflower something, a zucchini fritatta, and homemade pizza. Then she cooked our ravioli and noodles for us. I have to say, they were pretty good. Then for dessert we had the most amazing tiramasiu (and I don’t generally care for it). Overall, it was a fantastic day….good food and good company. So if you get the chance, try this one out and hopefully you’ll enjoy it as much as I did. So as many of you know, I love to eat. I have eaten my way through Germany and Italy over the last two weeks and it was fantastic. We got to Germany Tuesday and went to eat some schnitzel. 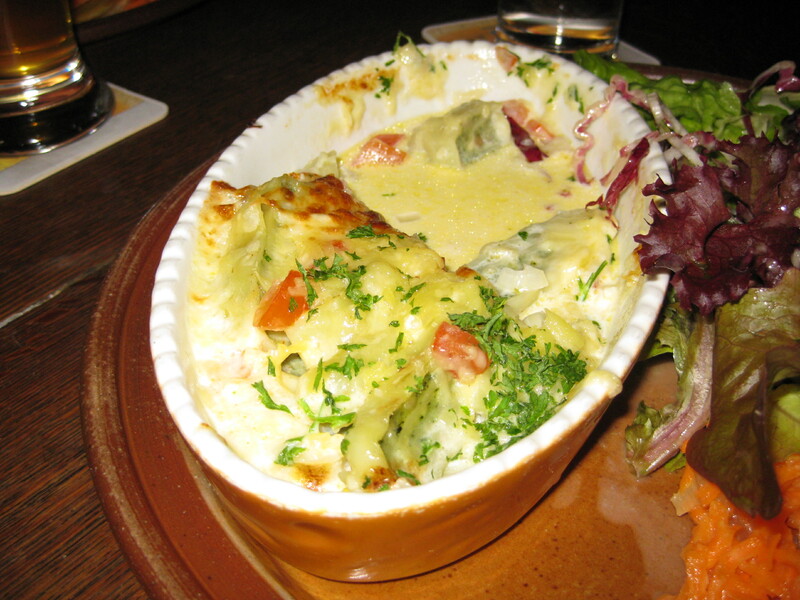 (That was my prime mission for my entire visit to Germany and I accomplished it fairly early on) We went to the roten ox restaurant. (I’m sure that S will be correcting me on that one. But I’m sparing myself embarrassing spelling errors) I had Jagerschnitzel and spaetzle and this delicious salad. It had all sorts of vegetables and real German potato salad. I learned today what one of the vegetable salads is…At least I think I do. I think the white unknown was a celery salad. I also had Heidelberg Hefeweissen with my meal. At just the temperature I enjoy it. The food wasn’t quite what I expected from Germany. It was better. I don’t know why I was expecting plain, bland food but everything I had was very good and it comes in these enormous portions. A certain co-worker would have been impressed with my leftovers each night. We had one night at the ‘really good restaurant’ and my mom had the clear winner of a dish. It was called maultauschen (sp??). 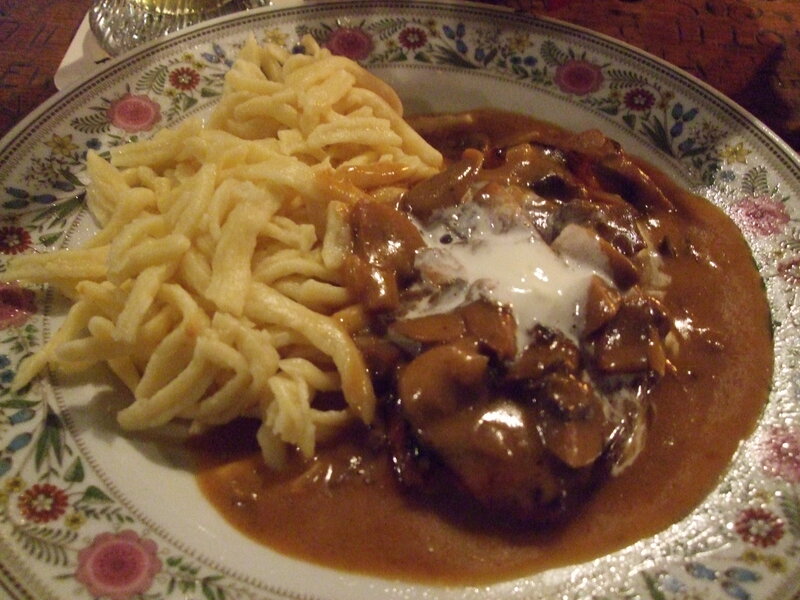 It is the specialty dish of Heidelberg. They are these delicious little vegetable and meat filled dumplings baked in butter and cream topped with melted cheese. Amazing. Our last afternoon there we went to the restaurant that A describes as sub-par but you get a lot of food and it is cheap. It was definitely two of the three. 8.50Euros for so much food but it was really good. We all had the schnitzel, tomato soup, salad, and french fries. I’m still amazed at how much food showed up at our table. Gelato…I love gelato and I think I had at least a dozen new flavors. I still can’t pick a favorite so I’ll continue to try new ones. We had quite a bit more time to eat my way through Italy. I was rather disappointed in Tony’s. I had such high hopes for the best lasagna in the world and his restaurant has gotten really busy in the last couple years and I feel like the quality has gone down a little bit. It was still good. Just not as good as it used to be. I can’t even remember most of Rome. I had some spicy pasta one night that was good. And I had some chicken and spaghetti one night too. Florence is where I like to eat. 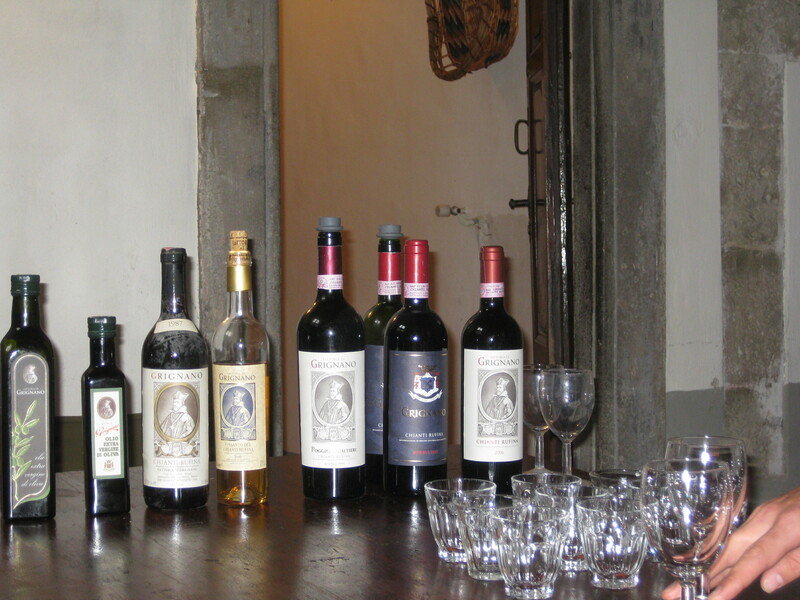 We went to Borgo Antico in Piazza Santo Spirito. They have this delicious spicy spaghetti but I opted for something new this time. Ravioli di patate. So Good that I actually went back and had it again before I left. A favorite from last time was the walnut ravioli from Za-Za’s and it didn’t let me down. We even had a couple fancy meals with meat. I had a balsamic steak one evening that was quite good. I should try to make the blueberry balsamic myself. One night at the fancy restaurant I had a steak and ‘spicy’ vegetables. I’m not sure if something was lost in the translation but they were not spicy. All in all, I successfully ate myself through a couple countries. There were no missed meals and amazingly enough I could always eat more. I learned how to make some pretty good pasta and stuff so I will continue to eat the way I am enjoying to right now. Come over and try some if you want!